Carefully crafted bistro fare complemented by a thoughtful wine list. : Dinner at Bistro Moulin feels like being swept away to a small café in the heart of Strasbourg. 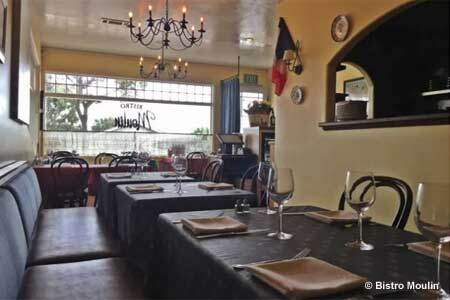 The intimate dining room --- home to about ten tables --- romances with country-style tablecloths, glowing chandeliers, walls lined with French and California wines (available for purchase) and shabby chic décor. Chef-owner Didier Dutertre serves simple dishes from his pint-size kitchen. A good place to start is with the wine list, which features more than 100 choices hand-picked by Dutertre. The minimal menu offers classic appetizers such as piping-hot French onion soup and escargots soaked in garlic and hazelnut butter. Homemade gnocchi aux epinards are fluffy, potato-less pillows of zest that get better with every bite. Hanger steak a la bordelaise, served with pommes frites, falls apart when pierced with a fork. Expect a little decadence for dessert, including crème brûlée and a trio of profiteroles filled with house-made vanilla ice cream and draped with chocolate sauce.